Below is the legal terms that protects our company, Addicted 2 Tungsten as well as the website http://www.addicted2tungsten.com. Should you have any concerns or questions needing addressed, please contact Addicted 2 Tungsten's copyright department at support@addicted2tungsten.com. Your use of this web site is governed by the terms and conditions set forth below. Please read them carefully. By using this web site, you agree to comply with and to be bound by these terms and conditions. If you do not agree to these terms and conditions, you may not use this web site and should exit from it now. Addicted 2 Tungsten reserves the right to change this web site and these terms and conditions at any time without notice to you by posting such changes to this web site. You may not copy, distribute, or transmit any of the content of this web site without prior written consent from Addicted 2 Tungsten. You may, however, make one copy of any material on this web site for personal, non-commercial use provided that you neither modify nor alter the material in any way, nor delete or change any copyright or trademark notice. Addicted 2 Tungsten reserves complete title and full intellectual property rights for materials copied from this web site. Addicted 2 Tungsten provides the content of this web site for lawful purposes only. Addicted 2 Tungsten provides this web site and its content "as is" and without any representation or warranty, express, implied, or statutory. Addicted 2 Tungsten specifically disclaims any implied warranties of title, merchantability, fitness for a particular purpose, and non-infringement. Without limiting the foregoing, Addicted 2 Tungsten does not represent or warrant that this web site will be accessible without interruption or that this web site, any content from this web site, or the server that makes this web site available are free from errors, defects, design flaws, omissions, viruses, or other harmful components. Your use of this web site is at your own risk. Some states do not allow the disclaimer of implied warranties, in which case portions of this disclaimer may not apply to you. In no event will Addicted 2 Tungsten be liable, whether in contract, warranty, tort (including negligence, whether active, passive, or imputed), product liability, strict liability, or other theory, to you or any other person for any damages (including, without limitation, any direct, indirect, incidental, special, exemplary, punitive, or consequential damages), arising out of or in connection with any use of, the inability to use, or the results of use of this web site or its content, even if Addicted 2 Tungsten has been advised of the possibility of such damages. Some jurisdictions prohibit the exclusion or limitation of liability for consequential or incidental damages, in which case portions of this limitation may not apply to you. In no event will Addicted 2 Tungsten be liable or responsible for any errors or omissions in the content of this web site, including, without limitation, errors in pricing or availability of services and products, or damages that may result from misrepresentation of age by a user of this web site. This web site contains links to third-party web sites. These links are provided solely as a convenience to you and not as an endorsement by Addicted 2 Tungsten of the companies or the content of any linked third-party web sites. Addicted 2 Tungsten neither controls nor is responsible for the content of linked third-party web sites, and Addicted 2 Tungsten makes no representations regarding the content or accuracy of materials on the linked third-party web sites. If you access any linked third-party web sites, then you do so at your own risk. Addicted 2 Tungsten trademarks used on this web site are trademarks of Addicted 2 Tungsten or its affiliates, registered in the United States of America and many other countries. Absent a written license agreement, you may not use these trademarks or any other trademarks belonging to Addicted 2 Tungsten. Other trademarks used on this web site are the property of their respective owners and are used in this web site solely for descriptive purposes. Mention on this web site of trademarks held by other parties should not be construed as a challenge to such trademarks' status or ownership. All content provided on this web site, including but not limited to button icons, formatting, graphics, images, logos, software, and text, is copyrighted by Addicted 2 Tungsten or its content suppliers under United States law and is protected by worldwide copyright laws and treaty provisions. This web site is created, controlled, and operated by Addicted 2 Tungsten in the State of Georgia, United States of America. The laws of the State of Georgia will govern these terms and conditions, without giving effect to any principles of conflicts of laws. For any legal action concerning these terms and conditions or this web site, you irrevocably consent to the jurisdiction and venue of state or federal courts located in Hall County in the State of Georgia, and you must bring any such legal action within such venue within one (1) year after the claim or cause of action arises. If you access this web site from outside of the United States of America, then you do so at your own risk and are responsible for compliance with the laws of your jurisdiction. These terms and conditions constitute the entire agreement between Addicted 2 Tungsten and you regarding this web site. These terms and conditions supersede all prior or contemporaneous communications and proposals, whether electronic, oral, or written, between Addicted 2 Tungsten and you regarding this web site. No modification of these terms and conditions will be effective unless Addicted 2 Tungsten authorizes it. If any part of these terms and conditions is unlawful, void, or unenforceable, that part will be deemed severable and will not affect the validity and enforceability of remaining provisions. member of the Bastrop Bass Club. He fishes the local tournament circuit and has gained amazing recognition the past 3 years. 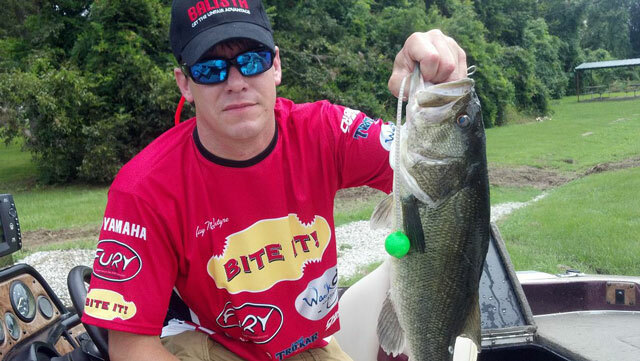 We have recently selected Clay as Addicted 2 Tungsten's official Pro Staff Director. He is prepared to take the role and help new and old anglers alike in tungsten weights! We would like to welcome Clay to the tungsten team and look for him to shine this year in the Louisiana area. Good luck Clay!